When it comes to food, there’s nothing more important that the ingredient itself. When ingredients are fresh and produced well, it hardly takes much to turn it into a delicious dish. Harvesting on that fact, Tai Thong Group is showcasing a Free Range Chicken Promotion at most of its outlets all over the city. Focusing on the quality of the free range chicken that is farmed in Semenyih, the restaurants are featuring these scrumptious free range chicken cooked with minimal elements and lots of efforts. We made a visit to Imperial Garden restaurant recently to check out the promotion as well as signature dishes available at most of their restaurants. 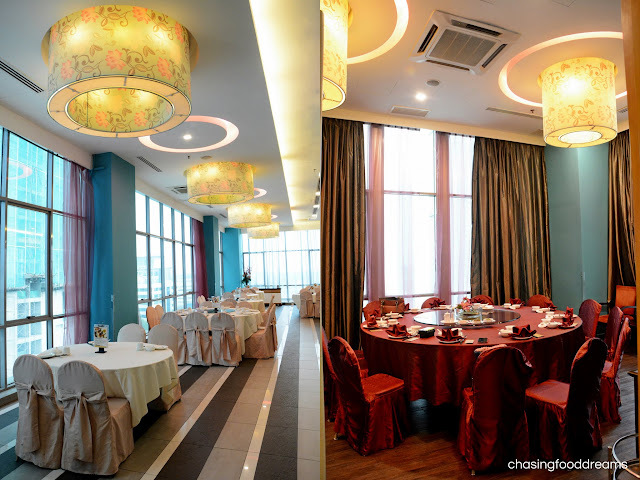 Imperial Garden is located at the strategic location of Petaling Jaya and is always a favorite hot spot when it comes to events and wedding affairs. The restaurant is beautifully decorated with the classic Oriental theme. There are several sections of the main dining area and private rooms available which is perfect for regular dining as well as private functions. Executive Chef Lee Wee Hong goes back to classic and cooked the free range chicken with minimal ingredients and seasoning to showcase the beautiful flavours of the chook. First up, Poached Chicken with Fried Shallot Oil 葱油白灼走地鸡 looked sublime with its pale creamy yellow skin, lightly glistening from the coating of supreme soy sauce and shallot oil. A bite into the firm and tender chicken was deliciously satisfying. One can taste the natural sweetness of chicken essence and the sauce and oil enhanced the chook just right. The chicken was smooth and very succulent. Hand me a bowl of steamed rice and I would be such a happy camper! The next dish of Salt Baked Chicken with ‘Tang Kwei’ 当归煙焗走地鸡 was even better than the first one. The aroma that lingered in the air as soon as this dish was served had everyone excited way before we even savor it. A richer and deeper hue of golden yellow on the chicken skin showed us that there was certainly going to be flavours, lots of it to be precise. True enough, the dish was elegantly moreish. The salt baked method deepened and intensified the chicken essence with a good dose of savory notes. Hints of herbal Tang Kwei added a tinge of bitter but delicious Chinese herb note. Free range chicken really have a delicious firm, smooth and tender texture. A must- order for this dish! The Free Range Chicken Promotion is available from 15 March onwards for a limited time only. Both dishes of Poached Chicken with Fried Shallot Oil and Salt Baked Chicken with “Tang Kwei” are priced at RM48++ for half bird, RM88++ for whole bird. Besides the Free Range Chicken dishes, we also savored other signatures at Imperial Garden from Chef Lee in the regular menu as well as some specials that require reservations in advance. Kicking off the appetizer list is Crispy Bean Curd with Fish Paste 酥化豆腐粒 (RM13++ per portion). Delightful mini cubes of crispy house made bean curd with fish paste was so appetizing, it was gone within few minutes. Great snacking bites! We simply enjoyed the Home-Style Yong Tau Fu of Stuffed Chili so much. The pleasure of biting into light blistered and crisp green chili stuffed with a juicy and bouncy filling of fish paste was absolutely divine. The heat of the chili wasn’t overwhelming but gave the dish a good kick. The robust dark brown sauce boosted more flavours. The Stuffed Bitter Gourd and Tau Fu Pok stuffed with Fish Paste was a little different from the Stuffed Chili. The fish paste filling was similar but the different vegetable and bean curd puff gave the dish a different flavour profile. Coupled with the stock that it was cooked, the dish was hearty and comforting in every sense. The chef uses smaller bittergourd so there was a good dose of bitterness which I really didn’t mind at all. The bean curd puff was soft and beautifully juicy as it soaked up the flavorful broth. Quick, hand me another bowl of rice…. Our next dish of Claypot Lamb Stew with Fermented Bean Curd and Water Spinach 腐乳空心菜羊腩煲 (RM30++ per portion) also requires advance booking. Chef Lee is quite the skillful maestro at giving his dishes a creative twist. Lamb chunks with bone-in are stewed in pungent fermented bean curd based sauce till it’s gelatinously tender and tasty. Pieces of Tau Kan or Bean Curd Sheet is also added to soak up the luscious intense sauce. Lots of spring onions and coriander finished the dish. The claypot was served on a portable hot stove to keep the heat going. While we thought the show was over, Chef Lee presented us with another fire showstopper in Flaming Drunken Tiger Prawn 火焰醉虾 (RM48++ per portion). Flaming up the prawns by the tableside, our shutters went berserk. The aroma was wonderful, almost intoxicating in a good way of course. When the flames died out, the steamy prawns were looking pretty glam in their bright red shells. The prawns were cooked well with a firm yet tender and utterly juicy and sweet. The light Chinese wine after note was sublime. No advance booking needed as it is available on the menu at the restaurant so order away. Our carb filler of the meal was Home-Style Hokkien Mee 家乡福建面 (RM20++ per portion). I would never have thought to order this classic street dish here but maybe one should. Chef Lee’s version was full of wok breathe with well braised thick yellow noodles soaked in dark soy sauce. Lots of prawns, pork slices, cabbage and crispy unctuous pork lardons completed the dish. Chef Lee knows that there are always ‘Chu Yau Char’ fans in every table and so he even serves some extra goodies on the side. Savor the noodles with the sambal belachan for extra happiness. This dish is actually available on the regular menu. The last time we had the special CNY Dim Sum of Baked Dried Oyster Tart (RM8.80++ per portion), we knew we had to savor this once again. Buttery and flaky sweet pastry encasing dried oyster filling is unusual and deliciously addictive. If you happen to be dim sum-ing at any of the Tai Thong Group restaurants, do ask if they still have this dish because it is worth trying at least once. Dinner ended with a simple Chilled Lemongrass Jelly that sufficiently cleanse our palate after all the heavy dishes. Chef Lee is based at Imperial Garden Restaurant so make sure to visit this particular restaurant for all his signatures above. Free Range Chicken promotion is available at all outlets except Spring Garden Putrajaya & Spring Garden KLCC. Visit Tai Thong Group website for more information on all its outlets and promotions. Free range is definitely nicer, the texture and the meat is sweeter/tastier...and of course, healthier. If free range corn-fed, even better!